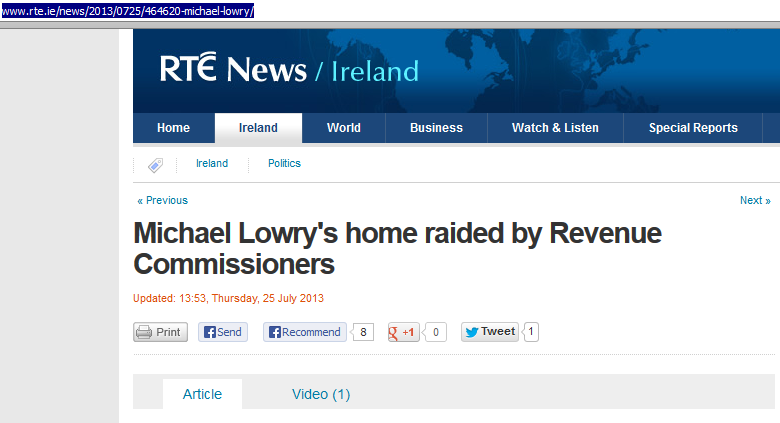 RTE News are today reporting that “the Revenue Commissioners have raided the home of Independent TD Michael Lowry”. I find this report very puzzling, and I’m at a loss to understand how this news came into RTE’s possession. I presume Mr. Lowry didn’t tell them – even if he had the time and inclination, I can’t understand why he would do so. After all, having one’s home raided by the taxman is an inconvenience that people generally prefer to keep to themselves. This generally means that if Revenue raid your neighbour’s home, it won’t feature on the national news. Yet Mr. Lowry’s latest tax discomfort has now somehow become public. Previous Post: Time to Scrap Tax Clearance Certs? I would assume that there’s an entirely unofficial Government PR contact who provides untraceable tip-offs to the press about matters like this. I’ve no idea about Mr Lowry’s tax affairs. But given his previous convictions, I’m guessing that Revenue are not on a random fishing trip. In some ways, Government agencies are in a “Damned if you do & damned if you don’t” position. If they do their job quietly at all times, the public accuse them of doing nothing to bring known rogues to justice. I’m thinking of former bank directors here. Yet they must respect every individual’s confidentiality, no matter how “open and shut” the case may be. So I’d reckon the occasional unofficial leak is sanctioned from on high. The paradox is that media scrums, in general, are not conducive to effective investigations. And the subject of the investigation can so easily cry foul if details are inadvertently or otherwise leaked into the public domain. The problem with high profile Revenue leaks is the risk of damaging the strong corporate reputation they have for confidentiality and discretion. And reputations take years to build up but can be so easily destroyed. to enjoy the FM experience over a mobile device. minds, they have not come to ‘learn’ football – they’ve come to play it with their mates. Earlier, newspaper numeric puzzles and crosswords helped people to scratch their grey cells for hours. You will definitely want to save your Coin for this character. His assistant Tony Barton took over, and guided the club to European Cup glory four months later.